Selling ancillaries isn’t a new phenomenon for airlines, but counting on data to step up the same for maximizing revenue or even delivering personalized, contextual experiences is a work in progress. So be it for analyzing the available data related to online behavior, coming up with relevant offers or improving upon areas like email retargeting, there is room for better results, says Justin Steele, VP, Product, Switchfly. It is time airlines move on from mundane moves, such as generic retargeting, and look at advanced retailing or digital marketing tactics to produce better results. The area of ad targeting is becoming increasingly sophisticated. In the ad tech space, one can target profiles based on data (non-personally identifiable information such as browser, time of the day, location etc.) and such inputs are being used programmatically to place a bid on ads with a better possibility of a conversion. As for content, one needs to measure how the same is impacting performance online. For instance, if a user is searching for car rental options in a city, how can a marketer make the display ad or a video exciting rather than showing one image post abandonment. Can I be shown an ad that is relevant to my online behavior, including on site browsing? Data is key to all this, and how it drives conversion. Ai Video – Is NDC disrupting tightly integrated processes? Is NDC starting to disrupt tightly integrated processes? Yes, there have been mixed reviews around the progress made by IATA’s standard, for instance, it is being pointed out that there was too much flexibility in the initial versions of schema and implementations weren’t the same. Today even some of the basic NDC messages are being re-factored. But then this industry has always been riddled with complexity, and now airlines are starting to look at the bigger picture – being in control of what they intend to offer, creation of that offer and serve the passenger at any stage of the journey via any touchpoint they desire to choose. In fact, as much as technology is being re-assessed, it is also being acknowledged that being “siloed” doesn’t help and adopting a retail mindset is not just for the e-commerce people. As Mark Egan, VP, Business Development at Farelogix, various departments are coming together, and airlines are moving forward in an earnest manner. What’s happening at this juncture is typical of innovation and technical evolution – blending the old with the new until the old becomes archaic. That’s how certain airlines are moving ahead with their airline distribution and merchandising technology - emerging platforms and messaging protocols are being bolted onto legacy airline systems. This paves way for capabilities such as personalisation, merchandising and dynamic offers. Airlines are exploring how to make the most of API-led distribution. There is lack of standardization as of now, what it means API are based on different versions of NDC or are not NDC-based. This means not only there is room for aggregation of APIs, but there are specialists who can 'normalise' these APIs into the latest version of the standard (as envisioned by IATA). And in doing so, there would be minimal impact on the content and functionality made available by airlines through their APIs. As Jorge Diaz, CEO, AirGateway, says, there is a difference in “theoretical NDC” and “practical NDC”. Diaz’s start-up is working on an offering based around NDC aggregation technology. It would enable full-NDC (from provider to consumer) real-time aggregation. NDC aggregators would collate content, and travellers will search, shop, book, pay and get their tickets directly from airlines. “The benchmark for digital retailing might be “Amazon”, but is it being astutely assessed from airlines’ perspective? If Amazon had to deal with intricacies of air travel, then it might not have taken off (as a retailer)! Not to say Amazon doesn’t have interesting twists on how to be a customer-centric retailer. But it isn’t as simple as that.” This observation from a senior IT airline industry executive sums up the quandary that airlines find themselves in. The gap between where airlines stand today and where a passenger demands them to be – as digital retailers, as customer-centric organization that can serve passengers the way they prefer – needs to be bridged. 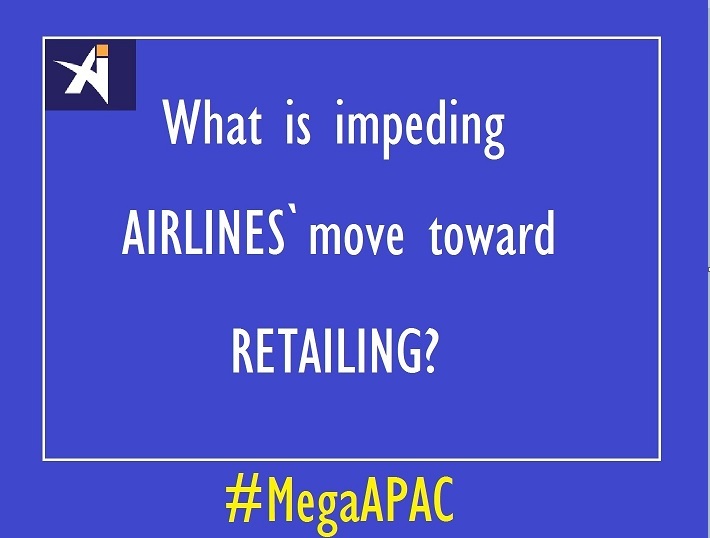 But getting rid of complexities associated with selling of air travel is one transition that isn’t a smooth one. It can’t be denied that travel isn’t purchased the way it was done before. Even as airlines are poised to make investment decisions, which can be excruciatingly slow in this sector, are they right in being cautious against going overboard with it? “Even NDC hasn’t shaped up the way it was supposed to. Various iterations had to take into account those complexities. It isn’t a negative feedback, but at the end of the day, when expenditure is going to be incurred by various stakeholders, the idea of a standard needed to be uniform. Probably because of the complexities, there was too much flexibility in the initial versions of schema and implementations weren’t the same. Today even some of the basic NDC messages are being re-factored. Is the complexity rising at the moment or at least for next 2-3 years?” questioned the same executive. How to figure out the core IT set up going forward? Are airlines opting to control their own merchandising, e-commerce and API technologies, using platforms that enable airline control, faster speed to market, and flexibility? Are they ready to move away from solutions that are hard-coded or community-model based, or tied to a particular PSS or channel? It seems PSS capabilities, which are essential to running any airline, are being separated from technology that can pave way for differentiation of travel offerings. A point of contention with current PSSs tends to be components based on mainframes running the transaction processing facility operating system. The debate is about efficacy vs. cost, flexibility etc. It is interesting to assess how NDC and One Order initiatives are initiating change, and how architecture-related roadmap is being devised for the core functionalities that are being performed by the current crop of PSSs. Do expect from new IT specialists “solutions that extensively use data-driven workflows, cognitive analytics and even self-learning capabilities to enhance offer and order management,” stated a whitepaper from consulting firm travel in motion, distributed during Ai’s Ancillary Merchandising Conference in Spain recently. So how systems that handle core functionalities related to running an airline evolve is one area that is worth watching out for. Is it right to say PSS will not be agile enough to evolve as fast as NDC? Are we going to see PSS as part of Offer and Order Management systems? If this is a possibility, then what sort of IT architecture would result in this? Another area that airlines need to focus on is to make the most of data in real-time to create personalised offers as well as serve the passenger at any stage of the journey via any touchpoint they desire to choose. This is important as in today’s “connected” era, where a traveller might restrict themselves to a 3rd party ecosystem – say Tencent’s WeChat or Google or Facebook - for their travel-related requirements, selling shouldn’t be the core objective. For instance, a traveller is on Facebook - reads a review about a meal or seats, posts a query on the business page of the same airline, interacts with a chatbot on Facebook Messenger etc. This means the journey-related experience is on a digital channel not owned by the airline. So the focus needs go beyond selling. Here the complexity is: the airline industry is, by its competitive nature, very adverse to openness. “We are also, by our safety-conscious nature, very resistant to change,” said a source. Beyond systems and processes, another area is personnel. travel in motion also highlighted that a carrier’s business units tend to be organized according to the traditional airline model. Being “siloed” doesn’t help as ecommerce is alienated, and adopting a retail mindset is not just for the e-commerce people, rather for the whole organisation. As we highlighted in one of our recent articles, executives on the board need to come from retailing background to drive this change, otherwise it will not work. Ai Editorial: When mobile pages load fast, users are likely to stay on a travel site for a longer period. Ai’s Ritesh Gupta takes a look at how travel search site Wego.com is counting on Accelerated Mobile Pages or AMP to deliver on this count. Fast loading of a site, quick browsing, express checkout…speed is an integral part of digital commerce. All of this needs to be delivered diligently on mobile, otherwise travel e-commerce brands are going to suffer. If any session is time-consuming, users don’t stay on a travel site and drop-off. Airlines need to look at areas like what shoots up the probability of a mobile site visitor bouncing off depending upon the page load time or how compressing of images and text can improve the performance. In this context, the progress made by Google’s open source initiative called Accelerated Mobile Pages (AMP) is coming to the fore. Before we delve into the efficacy of AMP, it is clear that Google’s prowess isn’t just about few tools. For instance, one timely notification about your trip – about pricing, destination content, flight itinerary etc. – is enough to keep on using Google. Concerns have been raised about Google’s rising dominance. In case of AMP, it has been pointed out that the power of the web lies in its decentralization and AMP should be rejected. In a sector-specific issue, airlines have been cautioned against collaborating with Google for initiatives like booking within Google’s domain or not provide any critical data that makes Google even more powerful. But it all boils down to who is serving user the best, and if Google can in any stage of the booking funnel, then brands tend to go with the flow. So how AMP is delivering? Why it is important? 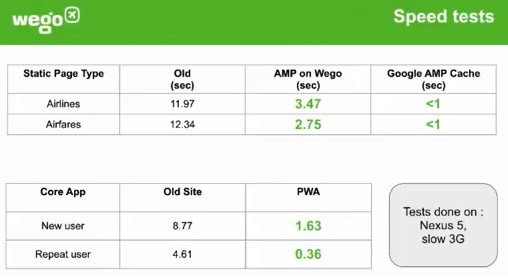 In a recent AMP conference, travel search specialist Wego shared its journey of mobile web development, and how AMP solves issues related to speed. Page-load speeds came down from more than 11 seconds to less than one second. AMP pages are stored in Google’s cache servers and load in milliseconds. First the team explained mobile web is indispensable in certain markets, where users struggle to download or retain the company’s app. - Jostling for space in a handset with 500MB storage capacity and not making the cut due to preference given to daily apps or other areas like photos, videos etc. being preferred over a travel app. - Another hurdle is slow network, say 2G, which eventually results in abandonment despite optimization of the size of the app and supporting multiple APKs (different APKs for an application are each targeted to different device configurations, Google Play allows one to publish multiple APKs under the same application listing). So reacquiring this user is an additional cost for the company. So mobile web plays a key role in such markets and also where Google Play isn’t popular or even blocked. Then Mittal went on to explain the mobile user journey. He referred to the core web app experience – comparing, zeroing down after filtering and sorting, and then the user is ready to be diverted to a partner site. Acquisition happens on static landing pages, called airline pages or airfare pages – featuring different combinations like city to city, city to country that cater to search queries like cheap flights from one place to another. These objective pages with information about historic prices, destination-related content etc. entice the user to do a live search on web app and eventually directed to a partner site for a conversion. Issues with this flow – load time associated with static pages, so the marketing expenditure incurred on links wasn’t yielding best results. It used to take 10-15 seconds for a page to download. And even if landing page used to open, conversion rate wasn’t up to the mark as there were issues with web app experience, too. This was proving to be inferior to Wego’s native app experience. “It was a responsive site, but not fully optimized for mobile,” shared Mittal, explaining that same code base as worked out for the desktop site, and also the same set of APIs were used for mobile as well. So designs weren’t tailor-made for mobile users. Also, as can be the case with an e-commerce site facing problem of too many trackers for attribution – tends to slow down a mobile site’s performance. Wego not only decided to go for the launch of AMP pages but chose to re-visit the entire flow in the second half of the last year. Wego opted to set up a PWA as well as specific APIs for mobile plus one source of tracker for being the single source of truth (enable all tracking on the server side). AMP pages were set up for popular static pages. The team chose to make AMP pages, and since these pages were also catering to desktop users, the team wasn’t sure of what to do with AMP for desktop users, so older pages were also there as the chronicle versions in conjunction with the AMP pages designed for popular static pages. 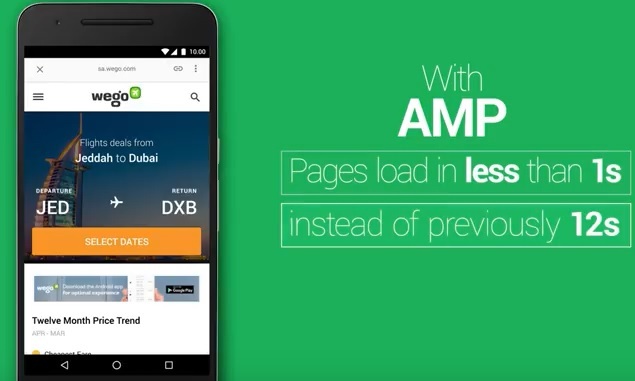 Also, the plan was to make smooth transition from AMP pages to PWA (engage users initially via AMP pages and PWA would help users compare travel deals before completing bookings) – the team used the AMP install service worker, for initiating PWA in the background. AMP is fast – tried on different networks, different devices, asserted Mittal. When served directly Google AMP cache is less than one second load times for the first meaningful interaction. There were important gains in terms of page load speed time. In terms of limitations, he explained: A user is required to do a search, so certain pieces of information are required - departure city, destination, dates, so users are provided with text box search and auto-complete option. For example, if a user types “LON” for flight search, one would expect options related to London (Heathrow, Gatwick, Luton etc.) AMP didn’t support that. Mittal also referred to calendars being an intricate part. Since Wego operations in the Middle East region, too, there is a need to support various calendars for different languages like Persian, Arabic etc. (calendars like Hijri and Shamsi are needed to be displayed in addition to Gregorian). Displaying weekends, public holidays, school holidays etc. is also important as users check on them while planning a holiday. Weekend is different, say Friday and Saturday in the Arab countries, Thursday and Friday in Iran. “There were gains in terms of speed, but certain areas of comprises in the user experience arena based on form filling criteria. So the team chose to do testing of form filling on PWA and assess if “gains outweighed the losses”. - App-like experience on PWA – users acquired from Google, reach on AMP pages (user can enter dates, say for hotels or call to action) to moving onto PWA and live search results in live results. First version of PWA was launched in three months (end of December), then two weeks later introduced first set of AMP pages, also worked on APIs and tracking mechanism, and user acquisition tests. Conversion rates to partner sites went up 95%, and search-to-conversion rates improved 49%. As for paid marketing results, Mittal shared that early results showed CPC and CPA going down by 10-19%. Google is already planning to bring the speed and performance of AMP to advertising, and advertisers are now looking at the speed of AMP for their paid campaigns in AdWords. Ai Editorial: Cost differentiation, NDC, machine learning… signs of change? Airlines are often criticised for not evolving fast or not being “agile” enough to embrace change. And this evaluation is fair enough considering what all can be done to serve today’s omni-channel, connected shopper. · Commercial strategy: It’s been two years since airlines of the Lufthansa Group announced their distribution cost charge of €16 for every ticket issued by a booking channel using GDS. A lot of discussions ensued about this bringing in a change. “There are so many tightly integrated processes in this industry… the combination of an organization owning PSS plus GDS is a dangerous combination,” used to be a common response from senior executives from the industry. But now the future of “full content agreements”, the role of GDS, airlines controlling their offer etc. are being discussed and even scrutinized in detail. And now with British Airways and Iberia stating that fees of €9.50 (per segment surcharge) will be levied on bookings not made via the airlines’ own websites or direct sales channels (exempted list also includes NDC connected channels and self-booking tools connected via NDC), airlines are trying to go for clear cost differentiation in the various booking channels. One of the reasons behind this move is to ensure as owners and providers of core offerings, carriers’ don’t compromise their “earnings”. While it is pointed out that NDC or New Distribution Capability, an IATA initiative for the adoption of a data transmission standard initiated in 2012, didn’t trigger any change in commercial strategy of airlines, the fact remains that airlines also have been working on plans to let their sales partners connect to their IT systems directly based on the IATA data standard NDC. Paul Byrne, ‎SVP Development at OpenJaw Technologies, says one aspect of NDC is for the airline to “control and create the offer, understand their customer and deliver relevant Offers that will enhance their travel experience”. He added, "NDC is about being able to offer better content, contextual content (to very channel) and a better customer experience by ensuring consistent content across all channels." The role of GDS could morph into being an NDC aggregator, acting as a conduit by passing on the request to the airline which would then know who the customer is and make a personalised Offer (rather than the GDS constructing an anonymous Offer and merely checking the airline PSS for flight availability, as is the situation today). Overall, distribution of ancillary products is opening up. For instance, today meta-search engines for the first time are letting travellers pay for their preferred seat on certain carriers via their site. Previously, this could only be done on airline.com. · Data-driven merchandising: OpenJaw’s Byrne also points out that NDC is facilitating distribution of existing and new products via the indirect channel in a much more timely manner, an avenue that wasn’t previously available. NDC will enable airlines to become better retailers – better use of data for increasing the conversion rate, coming up with relevant and contextual offers, etc., all of it getting extended to the indirect channel. For their part, British Airways have underlined that NDC will result in better service of customer needs with their ancillary products (for instance, pre-book additional luggage), faster access to new offerings, view product features for a true product comparison, etc. There is a realization that technology isn’t an issue - rather the drive or willingness to do it is the biggest hurdle. The entire organization has to support retailing. Airlines are becoming smarter with merchandising techniques. Yes, airlines need to focus on design, content, frictionless checkout, personalisation etc. to come across as a facilitator of travel essentials. But there is no need to do “heavy-lifting” all the time - like analytics for certain initiatives, maybe cohort analysis or access to data related to a holiday is enough to sell ancillaries (opening up of PNR data). For instance, as we highlighted in one of our recent articles, certain carriers are going ahead with their “pre-order” service, offering shopping of duty-free in advance. Airlines experience a ‎€70 average order buying, very often with a 15% conversion. Airlines should look at such conversion rate rather than worrying about .5% fulfillment error! From data and technology perspective, merchandising is being increasingly driven by optimization of data – transactional data, contextual data etc. Airlines are already relying on merchandising rules that control their business model, and as algorithms become more proficient, rules would become sharper and offers created would result in better conversion rate. Artificial intelligence (AI): Airlines can personalise, but without AI, without an ongoing conversation to learn from, customers and airlines can’t realize the value of true personalisation. “Similar to the way Uber brought the idea of ‘everyone’s private driver’ to the world, chatbot technology allows the idea of ‘everyone’s travel concierge’ to come to life,” says Jonathan Newman, commercial director at Barcelona-based Caravelo. The company recently introduced a transactional chatbot (via Facebook Messenger), Vale, for Mexican carrier, Volaris. Customer service and bookings are two facets that are starting to stand out. The industry is bullish about chatbots learning fast enough to serve travellers better. No reason why chatbot can’t take an order for a meal in an aircraft, or convey whether the flight is going to be on time or not etc. 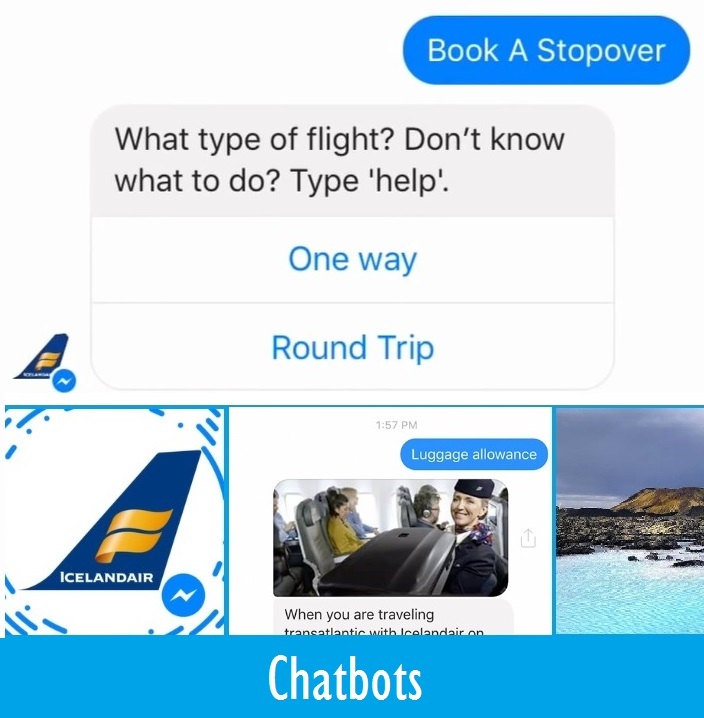 Airlines are starting to count on chatbots to capitalize on the usage of messaging apps in today’s API economy. Other than commercial strategy, initiatives such as merchandising and AI can also result in cost cutting. For instance, the pre-order service shows technology and merchandising can also reduce waste. “Many airlines accept a 35+% food wastage, with preorder of food not only do you reduce waste but you can offer a more appetizing range of food which will increase the demand and revenue. Fewer passengers will buy food before they get on plane! When you know and see what is being demanded you can respond as well,” says Paxport’s CEO Tony Barker. Similarly, with the efficacy of AI and chatbots, airlines can automate 1/5th – 1/4th of the tasks done by contact centre staff. Of course, automation of the customer service workforce would take time but by offering travellers a channel within the platform (like Facebook Messenger) they prefer and cutting down on certain operational expenditure there is definitely a case for building on AI. Be it for differentiation of their products, being in control of offers, cost differentiation, cost cutting or serving customers better than before, airlines are evolving. There might be only a few of them in most of these areas, but at least the change has been initiated. Ai Editorial: IT failure or power outage - how can airlines minimize the adverse impact? IT failure, computer glitch, power outage…these are becoming dreadful words for airlines. Flights getting cancelled for days put a huge question mark over contingency plans and the current state of business continuity planning at airlines. The extent to which British Airways has struggled, with its impact running into the third day now, exemplifies the issue this industry is facing at large. Delta, Southwest Airlines, United…all have been news in the last 12 months or so, featuring in cases where either passengers have been stranded or faced delays owing to such problems. 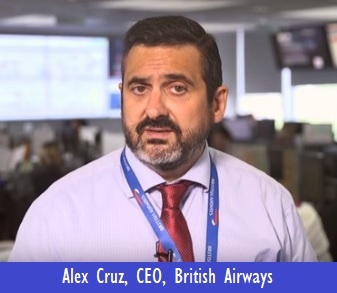 In case of British Airways, the CEO of the airline, Alex Cruz, told Sky News the IT outage was owing to “a power surge that affected messaging across their systems”. He has also been quoted as saying there wasn’t any indication of a cyber attack as per the initial inspection. Unlike the recent fiasco at United where a passenger was violently dragged out of the aircraft in the U .S., British Airways has at least attempted to handle the situation better with Cruz featuring in two videos in the first 74 hours. Not that there wasn’t any backlash on social media, still owning up what happened and what to expect at Gatwick and Heathrow airports was a sincere attempt to offer a realistic update. Of course, with their core offering getting disrupted in such a gigantic manner, British Airways would be required to offer an explanation, not to speak of the brand taking a beating and substantial monetary loss owing to this incident. In case of British Airways, it needs to be evaluated how a power failure can result in a disaster of such magnitude. Why was it so challenging to recover? It needs to be ascertained what typically can be issues that have impacted the likes of Delta and British Airways. At a basic level, evaluate computer programs, the servers backing the running of applications and also what sort of infrastructure is backing these servers. It is clear that the industry is falling short on one count – in order to avoid computer failures airlines must ensure there is availability of reliable electricity sources to start off. “Airlines need to look at what can result in data centre power outage and what’s in place to overcome such issues. What sort of infrastructure is required to ensure a failure doesn’t convert into a massive disaster? Is cost cutting a fair enough reason to avoid a failover site? In case, requisite power to the servers and applications isn’t reaching out, then what’s the backup plan for running operations? Airlines need to count on a different group of servers and applications, and the location of the same needs to be chosen upon in a diligent manner,” explained a source. Another question that has been doing rounds for years now is the efficacy of legacy code or mainframes? Is it true that disaster recovery procedures are difficult to be applied on legacy platforms? Not really, even to the extent that there isn't any major issue when it comes to “finding COBOL programmers” if needed. “Understand the role of flight operation systems and mainframe systems. Where are you running these flight-related systems, assess their network connectivity, and no point in comparing them with mainframes,” said an executive. The way forward is to get a balance between mainframe and decentralised technology. (We highlighted in a report last year that in case of Southwest and Delta, at no time was any mainframe system down at Southwest or Delta, and at no time was any mainframe system suffering from performance problems). On another note, a report by bbc.com about British Airways, indicated that even when the “power came back on, the systems were unusable because the data was unsynchronised”. What this means is that there could have been “conflicting records of passengers, aircraft and baggage movements”, a tough situation to deal with. Clearly airlines need to dig a lot and curtail such mishaps. Otherwise, this industry would continue to suffer, especially when the frequency of such incidents is keeping up of late. Ai Video – What would it take to identify a flyer? How to start with a transformation plan where the blend of data, technology, content etc. results in customer-centricity? JR Technologies has been making steady progress as a specialist, and recommends a platform that’s a blend of both offer and order management, standing out for business intelligence, passenger identification module etc. for a seamless journey (being aware of the current flight, current order, servicing needs etc.). It would also mean that the platform, running in parallel to an airline’s PSS, would feature complete PSS booking connectivity and document processing capability, converting PNR into “orders”. George Khairallah, President, JR Technologies says the company’s recommendation is not to start with offer management, rather with order management. Shopping in today’s digital economy is increasingly becoming simpler, faster and frictionless. Customers expect the same fluency to stretch beyond the booking experience, too, and in fact, return shopping to be even better! A shopper isn’t likely to differentiate between a travel and retail buying experience, and it wouldn’t be wrong to say shopping for a seat on an air plane, air ancillary or other components of shopping can be disappointing at times. Daniel Friedli, MD and Partner at Travel in Motion, acknowledges the same and asserts that in today’s digital environment “air travel is a step behind (when compared with other sectors), we are limited by what we can do, and how we do it”. Friedli emphasised that gearing up for digital retail transformation isn’t just about “tech”, rather airlines must take action on several other fronts as well. Some aspects that need to be assessed in addition to overcoming the limitations of legacy systems – what is the meaning of “retail mindset” and how can the same be blended with airline domain-specific expertise? How to ensure data is extracted from all systems and sources, acted upon in real-time to ensure a seamless experience is delivered? How to do away with limiting business processes? How the initiative related to the standardization of the IATA NDC XML schemas is shaping up? Chabots, essentially an autonomous program designed to interact with users, are gradually gaining prominence. So how are chatbots delivering when it comes to one-to-one personalised interactions? Specialists, with expertise in airlines-specific domain, point out that chatbots have moved on from limited utility or benefits to digitization of customer service, as well as encompassing one-click transactions. “No reason why chatbot can’t take an order for a meal in an aircraft, or convey whether the flight is going to be on time or not etc.,” says Jonathan Newman, commercial director at Barcelona-based Caravelo. - What all can be done by chatbots and the level of efficacy? What’s the success and error rate? - If a 3rd party platform is involved, for instance, Facebook, then how to deal with data ownership? - How bot training is progressing? - How to work with an airline’s marketing department for content, tone of voice etc. ?